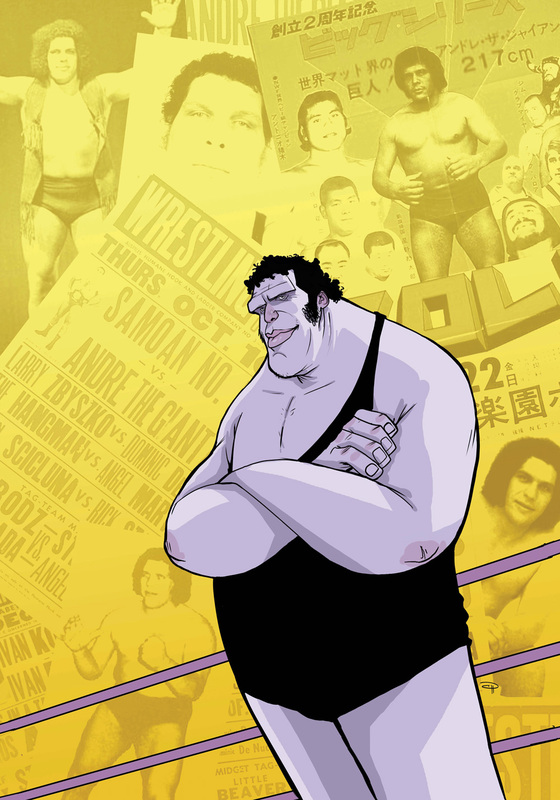 Los Angeles, CA – Lion Forge Comics and producers Scott Steindorff and Dylan Russellhave partnered to develop a feature film about the life of legendary pro wrestler Andre “the Giant” Roussimoff, based on the authorized graphic novel biography published last year,Andre the Giant: Closer to Heaven. Roussimoff’s daughter Robin Christensen-Roussimoff will consult on the film and assigned the exclusive rights for the biography to the producers. “Andre the Giant rode the wave of the rse of wrestling in America, while suffering from the painful health condition of gigantism; there’s an Elephant Man story here,” Steindorff said. 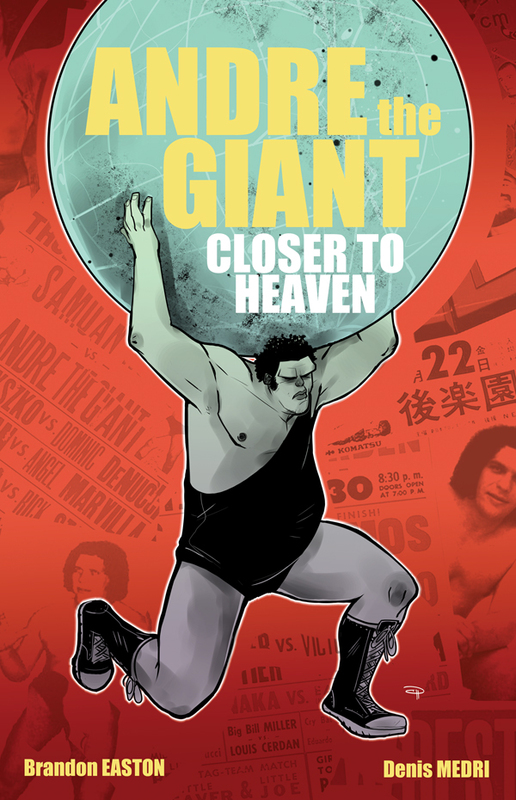 Written by Eisner Award-nominated writer Brandon Easton and illustrated byDenis Medri, Andre the Giant: Closer to Heavenwas nominated for the Dwayne McDuffie Award for Diversity and three Glyph Awards. It recounts the famed wrestler’s life from his earliest days working on the family farm in France along with the rise of professional wrestling itself, from a global circuit of underground matches to the global phenomenon it is today, due in large part to Andre the Giant’s celebrity. It is being republished in a new edition this month. I don’t do this often but I wanna talk about lance cade, as much as I am done watching WWE’s product until christian cage wins championship gold. It’s become pretty clear that people go either one of two ways on this subject, I do want to point out that this is a full grown man not a teenage kid. So, many people on wrestling forum sites that want to blame lance’s father or Vinny Mac both need to stop it. Sorry Mr McNaught, but you #$@ked up big time by saying that stupid **it. McMahon paid for your son’s rehab twice – that’s at least twice more than you did pal. Why didn’t you pull your son away from the business or the person who you now apparently seek to blame for his death? Hmmmmm? Good for Mr. McNaught. Please defend the honor of you son who gave his body and sould to the WWE. and what did the wallstreet Wrestling Entertainment do for him? Nothing, nada, zip, zilch. WWE treated his they way they treated chyna, umaga, kanyon, scott hall, hawk….the name go on and on. If you don’t know what I’m talking about here it is, lance cade died @ age 29. He was married and had kids. Some sites wish to blame WWE for their lack of care for WWE’s fallen talent . It’s a strong debate and the main argument is WWE created a wellness program to weed out future problems similar to this very situation. also giving the workers a rehab choice (is awesome) but how many wrestlers really get helped? For the record for many many years I was a WWF/E mark. I am not now,Not because of Lance Cade. the product isn’t geared towards the type of fan I am. the road life of these guys and gals is sick and none reading this will ever fully grasp it. I know I can’t nor do I ever want to. I do believe that wrestlers need time off but due to the fact of live TV and pre recorded tv tapings and house shows. if you miss two weeks of taping no one will care about you. Maybe not main eventers but mid carders will be easy to replace. You can whip a broken horse doesn’t mean you should! That’s why most talent use drugs to deal with the pain so they can entertain you. Is it right NO, did management ”tell you to do it” NO. But if you can’t perform they will push someone else who can perform. That is where WWE/F is at fault. Lance didn’t have to do the things he did but if you have to work you do what is best for you. So many stories come out about what wrestlers did or would do just to keep performing. Not big enough? come on! It’s so hard to tell someone they have a problem, who is to say that they didn’t try. Maybe Lance couldn’t deal with it, they can teach you to take a bump but no one teaches you how to live 300 days a year on the road away from your families and never truly getting enough rest. If you over sleep and miss your flight you will get suspended, if you are in pain and can work, you will not be seen on TV or worse they may take a PPV pay check out of ya. all I wanted to say is maybe WWE and Lance’s family could have done more, maybe. then again he was a 29 year old man who was in the Biz for a while and should have learned from others. as for Linda’s statement that Oh I think I met him once. that’s all it’s classy and dodges the questions all at the same time !